In this photograph, three immigration officials ask questions to an immigration applicant. Since the Chinese Exclusion Act only allowed certain people entry to the United States, such as merchants and relatives of American citizens, officials used a lengthy interview process to determine whether applicants were who they claimed to be. Witnesses gave interviews to support immigrants’ cases for entry, but these testimonies also served as a test. Officials asked applicants the same questions then compared responses to check for similar information and details. If a witness was coming from across the country, a detainee could wait weeks for a hearing. If their cases was denied, immigrants could face months or even years of waiting on the island for an appeal. 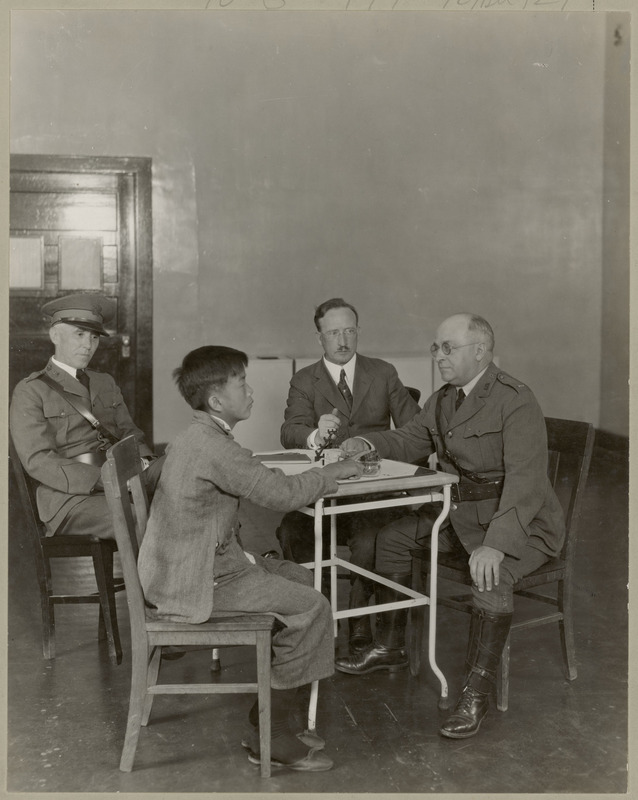 Department of the Treasury, Public Health Service, “Immigration Interview on Angel Island,” Digital Public Library of America, https://dp.la/item/bf55992da67c0773d5ab7ab2a8c2dae6.